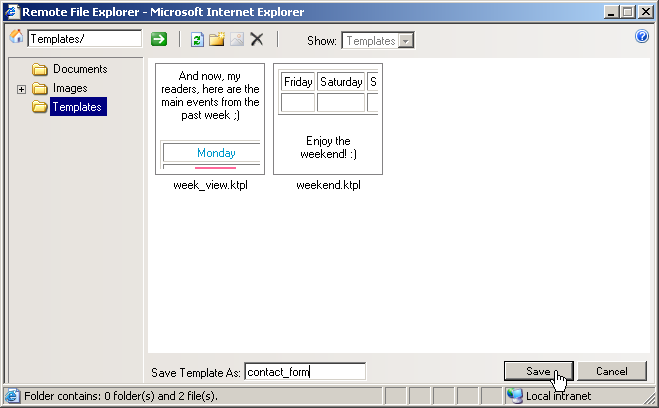 A tree-menu explorer (folder navigator) is displayed on the left, showing the folder structure on the server. The files included in the selected folder are displayed as thumbnails on the right. You can select one or more files (holding the Ctrl or Shift key pressed). You can copy, cut and paste files between folders. Files can also be renamed and duplicated. For a complete description, check out the right-click contextual menus when manipulating folders and selecting files! The next time you launch the Remote File Explorer, the folder that you worked with previously will be remembered and its content will be displayed. All the selected files will be uploaded to the remote server, and you can see them displayed as thumbnails in the Remote File Explorer window. This file list can be modified according to your needs. Click to learn how to do it manually, in Dreamweaver, in Visual Studio. Note 2: Remember that when uploading images, in case they exceed the maximum dimensions set in the configuration file, they will be boxed-resized. Read more here. By clicking the Insert button, all the files selected (hold the Ctrl or Shift key for multiple selection) in the current remote folder will be inserted in page. Note: Document files will be inserted as links. Once a link is pressed, the document file stored on the remote server will be opened. By clicking the Cancel button, the Remote File Explorer window will close and no file will be inserted in page (even though they are selected). This operation will not cancel the creation of new folders on the remote server or the upload of new files. No matter what folder is currently selected in the tree-menu on the left, when you click the Home button, the home folder on the remote server will be accessed and its files will be displayed on the right. If you haven't done any specific settings in this regard, the home folder is by default the root folder. 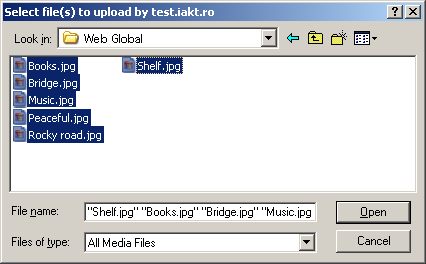 The Home text box on top of the interface displays the path to the current folder (that has its files displayed as thumbnails in the files area on the right). The displayed path is relative to the folder root defined in the File Browser module. In the Home text box you can also type the path to a certain folder (e.g. folder_1/folder_12/). If the folder is straight on the root, you can simply type its name. Once you click the Go button, the files in that folder will be listed on the right. By clicking the Go button, the file browser will navigate to the folder specified (its path) in the Home text box. If the text box is empty, the files stored on the main root will be displayed in the files area on the right. Note: The default name is New Folder. If you leave it like that, and then try to create another folder in the same parent one, the new suggestion will be New Folder 2, and so on (New Folder 3, New Folder 4, etc.). If there is no folder selected when you click this button, the new directory will be created straight on the root. If there is a folder selected, it will become the parent of the new directory. The Edit Image button is only enabled when an image file is selected in the files area. Once clicked, it will open the KTML Image Editor window, that provides a complete set of operations to help bring images in perfect shape. If the selected folder is empty, it will be deleted without asking for confirmation. Note: The same operation can be performed by using the Delete key from the keyboard. According to the upload folders you set for document, media, and template files, the Show drop-down menu will display certain options. Depending on the selected option, only files of the specified type from the remote folder will be displayed (as thumbnails), simplifying your work. The option selected in the Show drop-down menu also influences the files upload operation: when clicking the Upload File button, only the type of file specified in the Show drop-down menu will be displayed (in the folder from which you are uploading files). · Media Files - it is the default option when you click the Image button. It includes images and video files. · Documents - it is the default option when you click the Link to Document button. · Templates - it is the default option when you click the Content Template button. It is always displayed as disabled, no matter if the configured templates upload folder coincides or not with the documents and/or media files upload folder. · Image button from the toolbar, the Show drop-down menu will contain the following options: Media Files, Images. · Link to Document button from the toolbar, the Show drop-down menu will contain the following option: Documents (disabled). You can upload the image in the documents upload folder and then create a link to it as if it were a document file. You can upload the image in the media files upload folder and then create a thumbnail. Note 2: If the documents upload folder and the media files upload folder are the same, when you launch the Remote File Explorer window by clicking either the Image or Link to Document button from the toolbar, the Show drop-down menu will contain the following options: All Files, Media Files, Images, Documents. 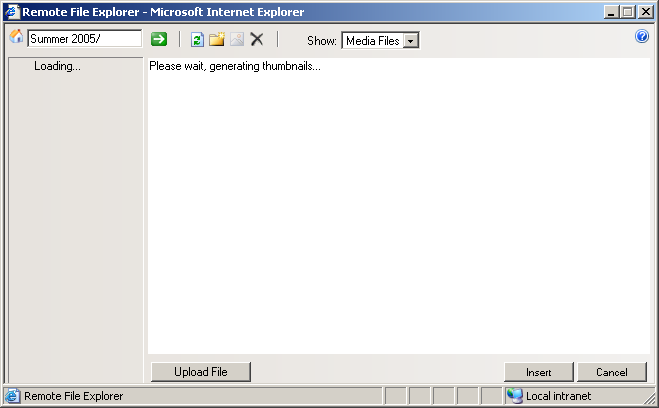 The Help button on the top-right corner of the interface has the same role as described here, just that it regards the Remote File Explorer interface. 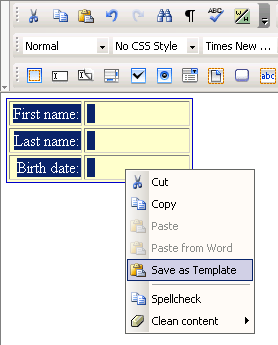 In the Save Template As text box enter the name (without extension) of the new template file. The automatically added extension when saved is .ktpl. Click the Save button after you named the template file and after you selected a folder in the tree-menu explorer. The template will be saved in the selected folder. Notice that the Show drop-down menu is disabled and set on Templates. This is why only the template files in the current folder are displayed as thumbnails. Note 1: The folder structure displayed in the tree-menu on the left can differ when you call the Remote File Explorer window using the Image button from when you call it using the Content Template button. This is set in the configuration options. Note 2: The Ctrl+A, Ctrl+X, Ctrl+C, and Ctrl+V shortcut keys work in the Remote File Explorer as well, allowing you to select all, cut, copy, and paste files.